A good start to the day; it could hardly have been better for the host nation as play commenced on Thursday 12th April at the Gold Coast Commonwealth Games in the Oxenford Studios. Jian Fang Lay and Miao Miao emerged successful in their second round Women’s Doubles contest; moreover, they caused an upset; they beat Singapore’s Lin Ye and Zhou Yihan, the no.3 seeds in a contest the enthralled the early morning crowd. However, as the engagement commenced, a victory appeared a far cry; in the opening game they trailed 6-10 before winning six points in a row. However, the loss of those points appeared only a hiccup, the Singaporeans dominated the next two games and appeared to be in command. Urged on by cries of “Aussie, Aussie, Aussie”, the duo recovered; they forced a fifth game and at the change of ends in the decider led 5-2, it was an advantage they never relinquished; a five games win (12-10, 4-11, 2-11, 11-6, 11-8). Success for Jian Fang Lay and Miao Miao, there was also success for one further Australian pair in the third round of the Women’s Doubles event; away from the glare of the show court Michelle Bromley and Melissa Tapper beat Malaysia’s Chang Li Sian Alice and Tee Ai Xin (11-2, 12-10, 9-11, 11-7). Problems for the third seeds; not for the other leading pairs, status prevailed and there was success for Singapore. 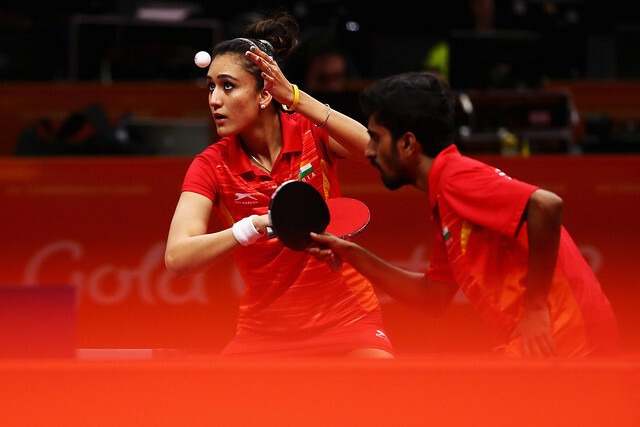 Feng Tianwei and Yu Mengyu, the top seeds, accounted for Guyana’s Natalie Cummings and Trenace Lowe (11-3, 11-2, 11-4); similarly India’s Manika Batra and Mouma Das, the no.2 seeds, overcame Sri Lanka’s Hansani Kapugeekiyana and Ishara Madurangi (11-4, 11-4, 11-1). Impressive performances, after a somewhat hesitant start, Canada’s Alicia Côte and Zhang Mo, the no.4 seeds, overcame England’s Denise Payet and Kelly Silbley (8-11, 11-7, 11-4, 11-3). The contest was to some extent déjà vu for Kelly Sibley; four years ago in Glasgow, partnering Joanna Drinkhall it had been defeat in the bronze medal match against Zhang Mo who on that occasion partnered Anqi Luo.